Exuberantly exploring this world of felines, food and trash! In an age where a good decent pizza for not too much money is difficult to come across in many of Melbourne's suburbs, I was pleased when a Sunday night dinner trawl had some friends and I come across Angelo's Pizza E Cucina. What our combined hunger wanted was a thin tasty fired dough, and a good bite of ham and all of the trimmings, and that is exactly what we found with ease at this late-night unassuming pizzeria. The pizzas are large and generously adorned with all of the traditional toppings. The current trend of psuedo-gourmet ingredients are also available for those that wish them, but the selection doesn't overwhelm the menu board. As well as that there is a large selection of pasta, and even a parmigiana or two should your rumbling stomachs so desire. We opted for two family sized pizzas to share between 6 people. At approximately $18 a pizza, we and our now full tummys, thought it was fairly decent pricing. Though it did make me wonder where the days of $10 gigantic pizzas had tottered off to. If anyone knows, please call them back, I would like to see them again. A warning to those who hunker after a good spot of chilli: the Messicana is best downed with a glass of something or other. The heat level is around sweating for even the most seasoned spice eater amongst the group I was with. The other type we chose was Capricciosa (my favourite), which could've done with a few more anchovies and olives. The flavour to ham ratio was a teeny bit off. The service was quiet, simple and of a friendly nature. The place wasn't too busy at the time, there were only 2 other parties awaiting their orders. Waiting time between ordering and leaving with steaming food-heavy boxes was around 10 minutes. If waiting isn't your bag, there is also the option of home delivery available. 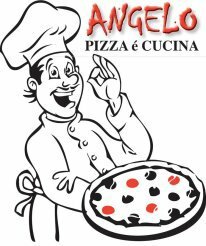 Given the shops yummy easy produce and its proximity to one of my many home-away-from-homes, I think that Angelo's pizzas and I shall get rather well acquainted over the course of this year. I may even squelch out of my comfy traditional pizza taste-bud preferences and end up trying one of the tasty looking gourmet options!